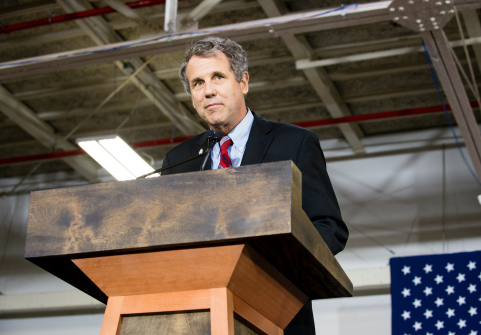 WATERLOO, Iowa—Senator Sherrod Brown (Ohio) not only thinks that Medicare for All isn't "practical,"but he's also critical of fellow Democrats that "embrace the plan to feel good" while ignoring solutions that can make an immediate impact. During a meet and greet on Friday evening at the home of a local elected official, Brown was asked about his refusal to support the Medicare for All proposal championed by potential 2020 Democratic presidential candidates like Senator Bernie Sanders (I., Vt.) and nearly a dozen others. Brown, who is weighing his own bid for the 2020 Democratic nomination, had just begun to explain why he favored a health care plan capable of making it through Congress and improving "people's lives today" before he was cut off. "They will if they find out the people are for it," the woman, who initially asked the question, interrupted. "Educate the people." "Well, I tried to educate the people, but I want to help people and make their lives better now," said the senator appearing unfazed by confrontation. A self-described "progressive populist," Brown was one of the few members of the Senate Democratic conference to not cosponsor Sanders's Medicare for All legislation in September 2017. At the time, Brown said the decision resulted from a desire to focus on his own bill that would allow people 55-years-of-age and older to purchase into Medicare. The decision spawned criticism from progressives, including a few who implied Brown's opposition was linked to the fact that he'd received more than $50,000 in campaign contributions from the insurance industry. Since signaling that he was considering a presidential bid, criticism on the left has only grown. Despite the pressure, Brown has remained stern on the topic, which was evident on Friday. "My ideology says universal coverage today," Brown said gesturing with his hands as he spoke. "But I want to see peoples' lives better. We'll keep having this debate and people will say Medicare for All and nothing will change." "I think if we can make that change of Medicare at 55 [years of age] or Medicare at 50 it will make all the difference in the world for millions of people and then we get to the next step. Otherwise, it's this sort of tilting at windmills where everybody feels good saying ‘I'm for Medicare for All,' but nothing changes." Brown added that he "wanted to get to the same place" as proponents of Medicare for All eventually, but wanted a realistic plan that could make it through Congress. Members of the crowd, however, appeared mixed on the subject. "I like his message, but I'm not sold an incremental approach to change works anymore," Scott, an attendee at the event, told the Washington Free Beacon. "Things are so just crazy at the moment. I'm ready, I think most people are ready for someone who can cut through the gridlock and the nonsense to accomplish big things." Brown, for his part, appears unlikely to change his mind anytime soon. During an interview with the Clear Lake Chamber of Commerce on Friday, Brown reiterated his commitment to Medicare at 55 because it was the only plan that possibly could "get through Congress." "I’m not going to come and make a lot of promises like President Trump did. … I’m going to talk about what’s practical and what we can make happen. And if that makes me different from the other candidates, so be it," he said, as first reported by the Hill. Brown's opposition to Medicare for All puts him squarely in the same camp as Michael Bloomberg and Howard Schultz, two moderate billionaires who have also expressed interest in a 2020 run. This entry was posted in Politics and tagged 2020 Election, Democratic Party, Health Care, Iowa, Medicare, Sherrod Brown. Bookmark the permalink.